Pro Tools | MusicTech Focus: Pro Tools 2013 Is Out Now! MusicTech Focus: Pro Tools 2013 Is Out Now! We were delighted when our friends at MusicTech magazine invited us to contribute to the up-to-date edition of MusicTech Focus: Pro Tools 2013. 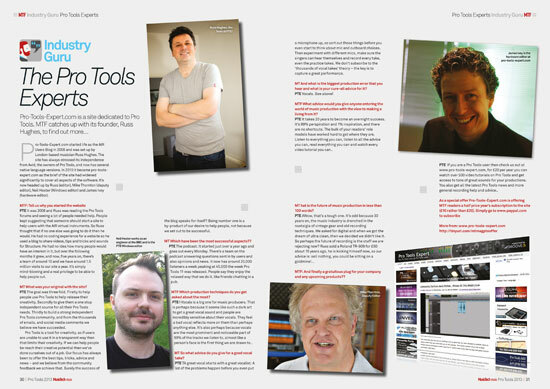 It’s packed with the latest info on Pro Tools 11 and you’ll find a two-page article featuring 4 odd-looking characters. To celebrate the release of version 11, we bring you 132 pages of Pro Tools wisdom, compiled by the MusicTech experts. Including tutorials, reviews, features, interviews and all the best tips and tricks. It is quite simply the essential guide for the creative Pro Tools-using musician. When software reaches version 11, it’s fair to say it must be doing something right. With Pro Tools, that “something” was setting the industry standard in studios across the world. But other DAW producers were quickly catching up and the latest version had to be something other than “just” a refinement. And Avid got it just about right on that score. Pro Tools v11 is very much a new start and, some would argue, what v10 should have been. You’ll find a two page article with 4 odd looking characters. So, with the start of another chapter in the life of one of music production’s brightest stars, it seems appropriate for us to celebrate the arrival with this special Pro Tools MusicTech Focus. Not only do we examine all of 11’s new features, we look at the software from both music production and post production perspectives. We have tutorials that cover pretty much every aspect of music making (which should be relevant to PT users from v9 onwards) and even features on making money and landmark recordings. We chat to pro users in the field including The Pro Tools Experts and Halo 4 composer Neil Davidge. In short: everything and everybody Pro Tools.